Posted on December 15, 2013	by Smiling Road Warriors! After several very relaxing days near the beach in Kep, Cambodia, we were back on the road again, this time for a 4 hour drive north along the border and ultimately entering into Vietnam. 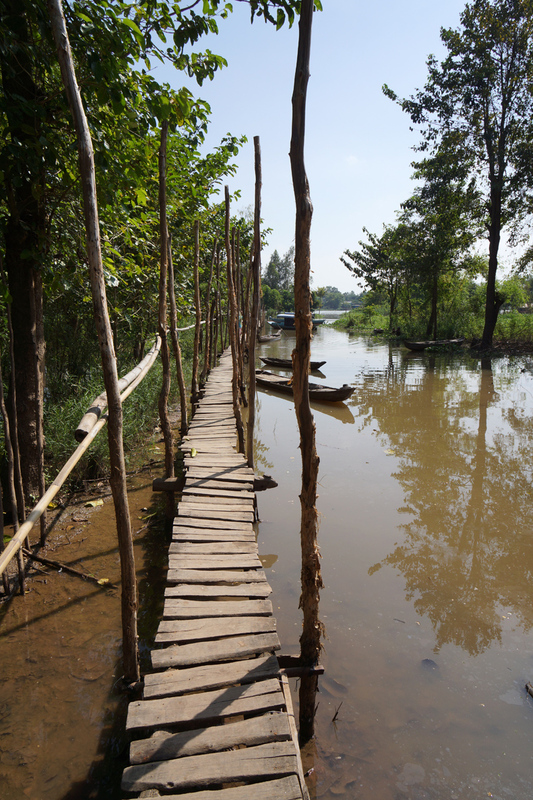 It was very interesting to experience the process of crossing the border into Vietnam from Cambodia. We were especially glad we had a guide who handled all the necessary paperwork at the crossing so we weren’t held up there for hours. Saw some other tourists who were more than a bit panicked that the Vietnamese officials were taking so long and their bus was about to leave without them. Our Cambodian driver couldn’t cross over into Vietnam with his car so, with us in tow, our guide had us walk through the gates, present our documents to the authorities, hop in a new car with driver, and drive on to the city of Chau Doc, Vietnam. It was a lovely ride through the country-side with beautiful green rice fields and large canals along side the road at every turn. The homes here are all situated along these very narrow roads on dikes with the rice fields and canals directly behind them. 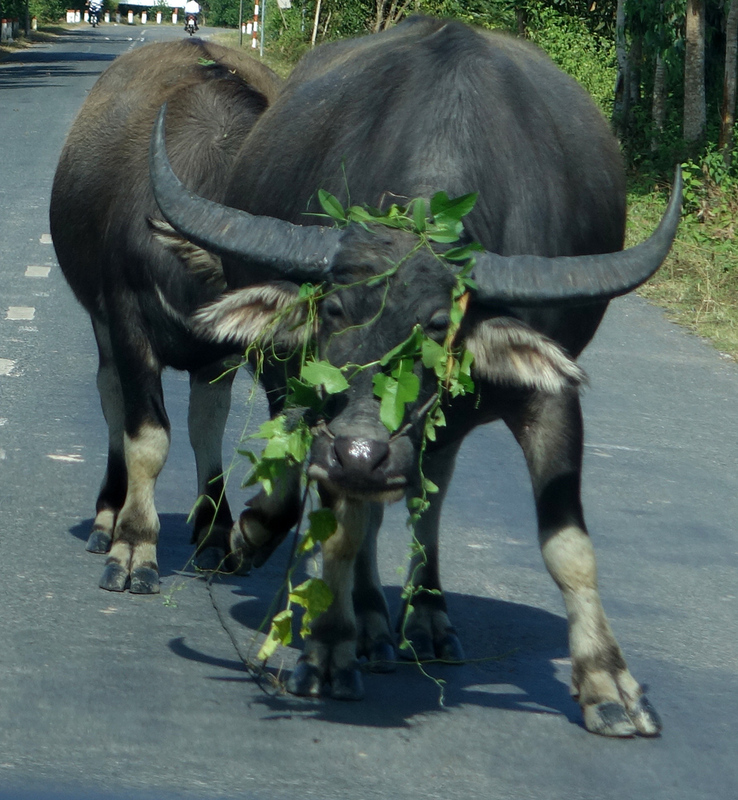 Water Buffalo who took a bit of coaxing to cross the road . Just out of the canal and couldn’t get rid of the water hyacinth vines. The city of Chau Doc, the first one of any size you come to in this far southwestern region of Vietnam, is a relatively small town by Vietnamese standards (about 150,000); we walked along the river-front and through the market area downtown before having dinner at our hotel, which is situated at the junction of the Basa (so-labeled as it flows south from Cambodia; and the Hau in Vietnam) and some of the tributaries of the Mekong Rivers. 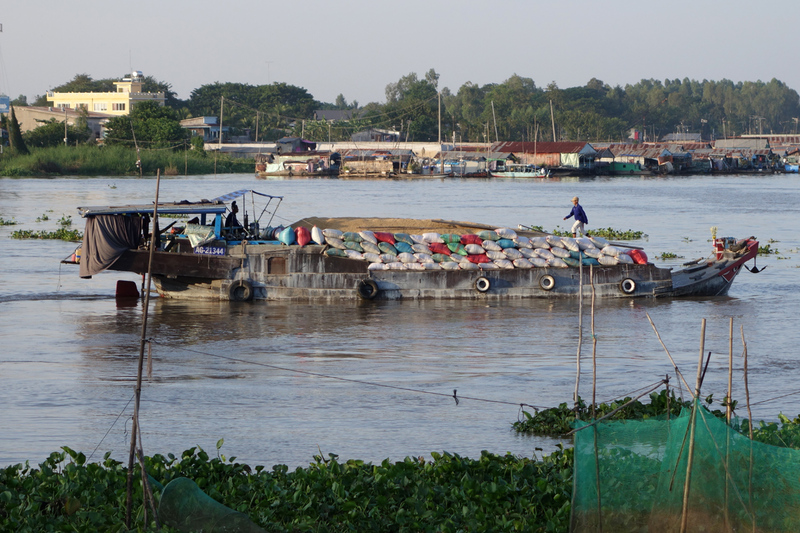 Now we were beginning to feel like we were really in the Mekong-Delta area – – river traffic was constant, with vessels of every size, shape and description. In fact most of them are actual dwellings, wherein a small family lives and works transporting either goods or people up, down and through the many canals and tributaries of this vast system of ‘watery highways’. 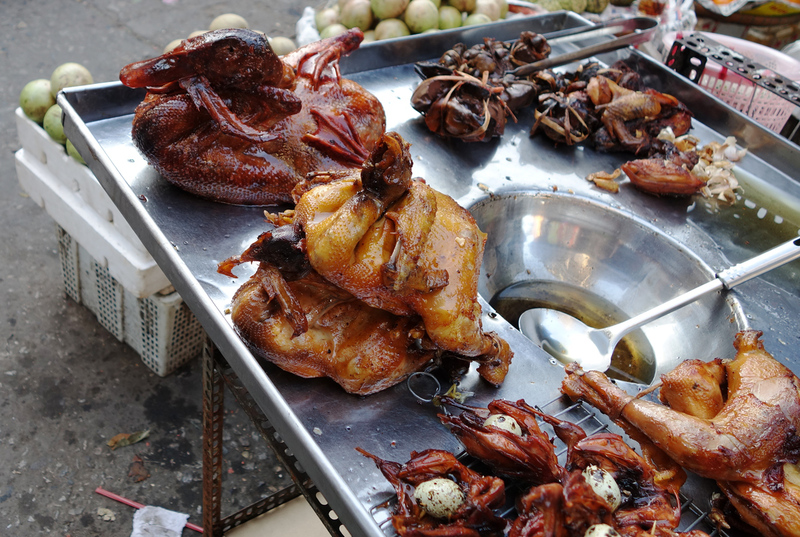 the downtown Chau Doc market — gotta’ love the way they present a Duck! (and the quails with their eggs). 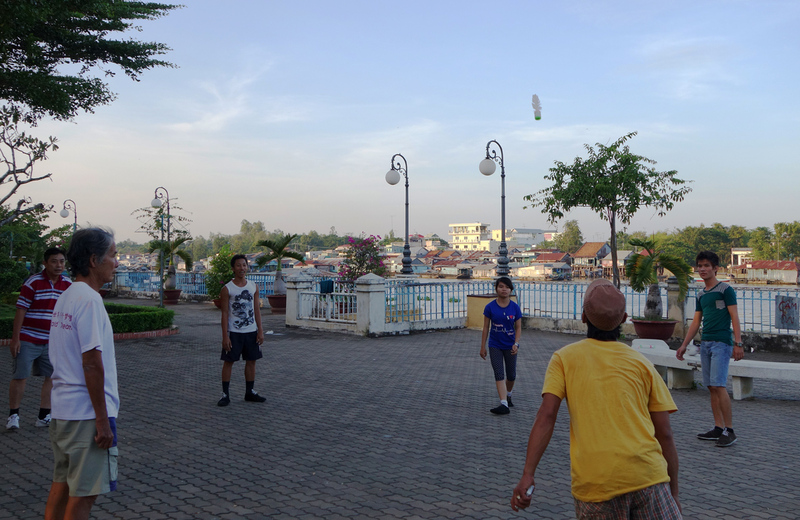 Came across these guys (and gal), playing a game of “kick-shuttle” on the river front (see the shuttle in air?). And boy, are they good! Not unusual to see them keep it in the air over 10 kicks, including back-heel shots that would make David Beckham wince! 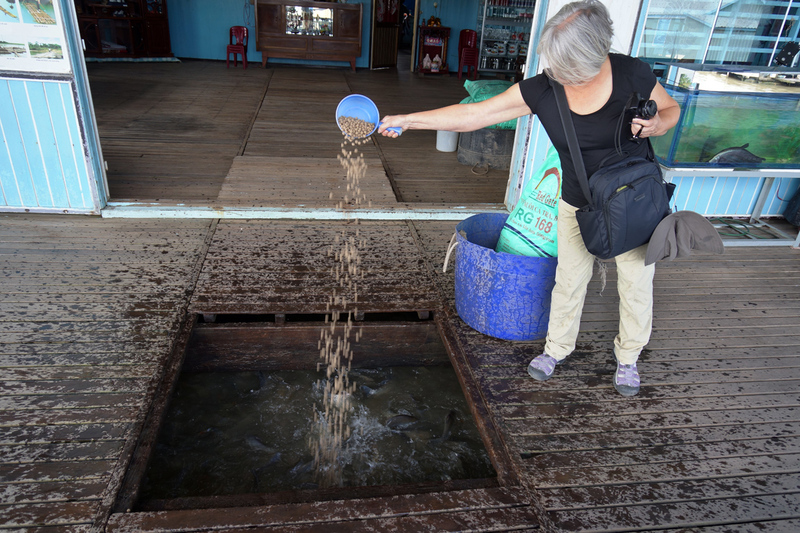 The next morning we took a boat ride on the waterways and stopped at a floating home where they raised fish undeneath their home. A very gracious family, they were proud to show us through their home and the way they made their living. 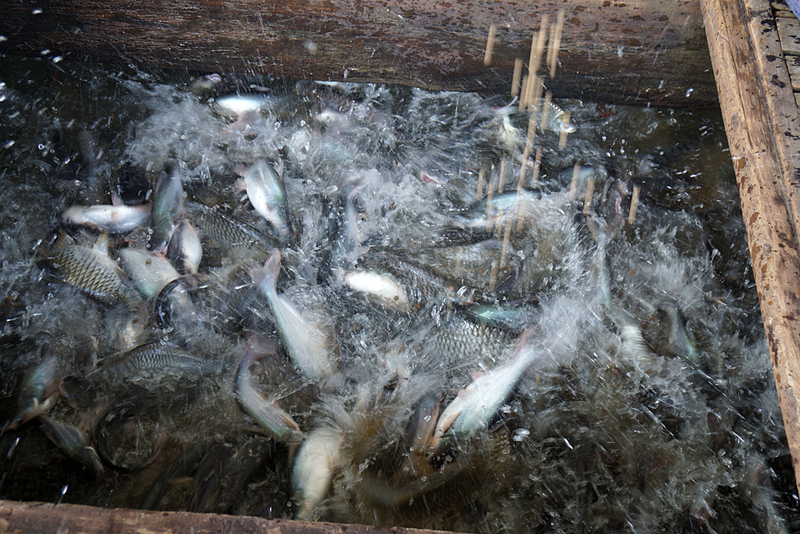 Fish-farming provides a relatively up-scale income, and you could tell they were good at it. 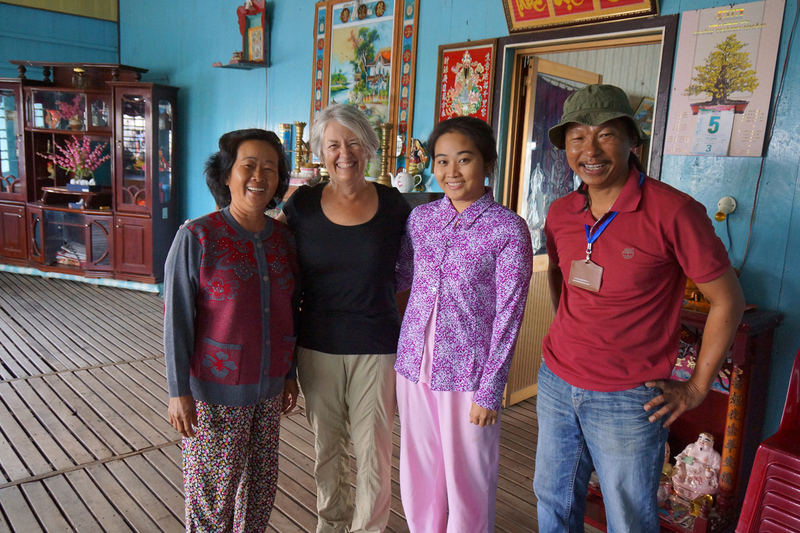 Their lovely daughter spoke English, so we were able to learn a great deal about them. 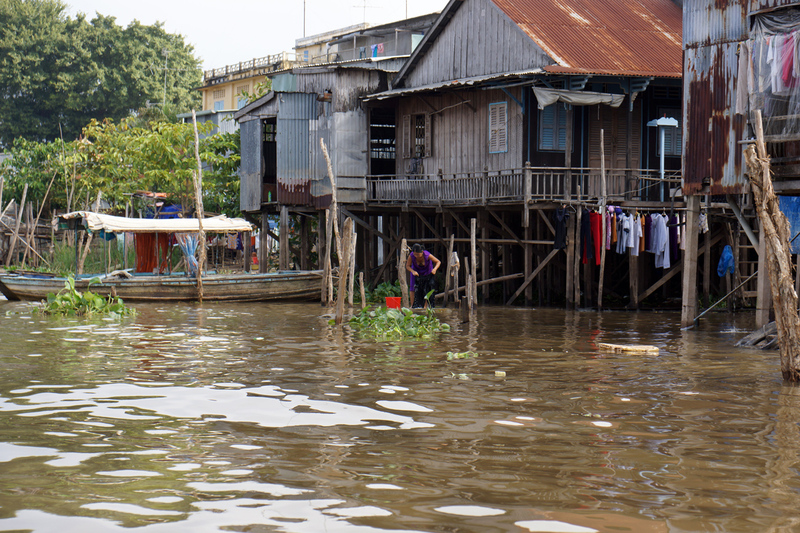 Typical home along this portion of the river. You wash clothes in it, bath in it, use it household water (when boiled! ), and its your principal highway. Our hosts fish-farm under their house. Evie had ’em jumping up to her feet! Boy! Are these guys famished! They raise them until they get about 10 to 12 inches in length and then sell to the markets and restaurants. Several varieties in here: best I can tell, they look a lot like fresh-water Perch, and some ‘Elephant-ear’ fish. GREAT eating (Gary can attest). Mother & daughter in their home and along with our intrepid guide, Long. This is really a wonderful living space . 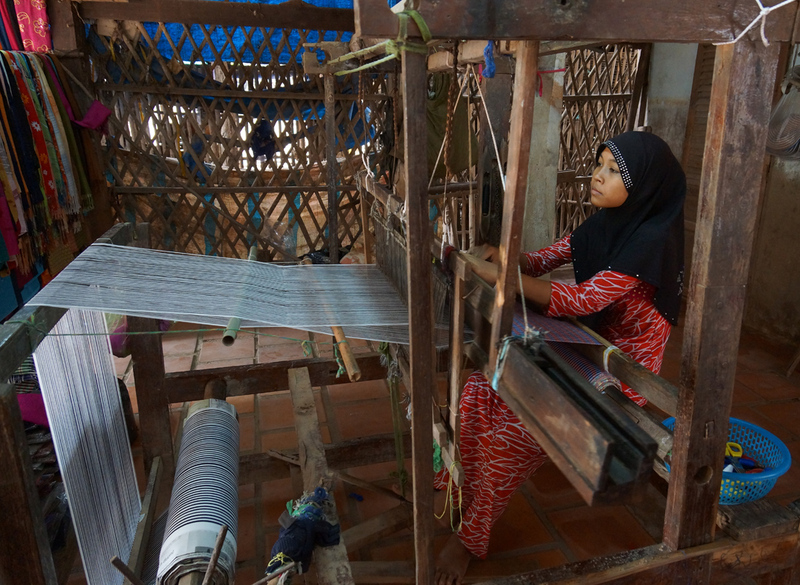 . .
We journeyed on by our boat taxi to a “Cham” village — this small ethnic group follow the Muslim faith, and they produce lovely textiles and other handicrafts. 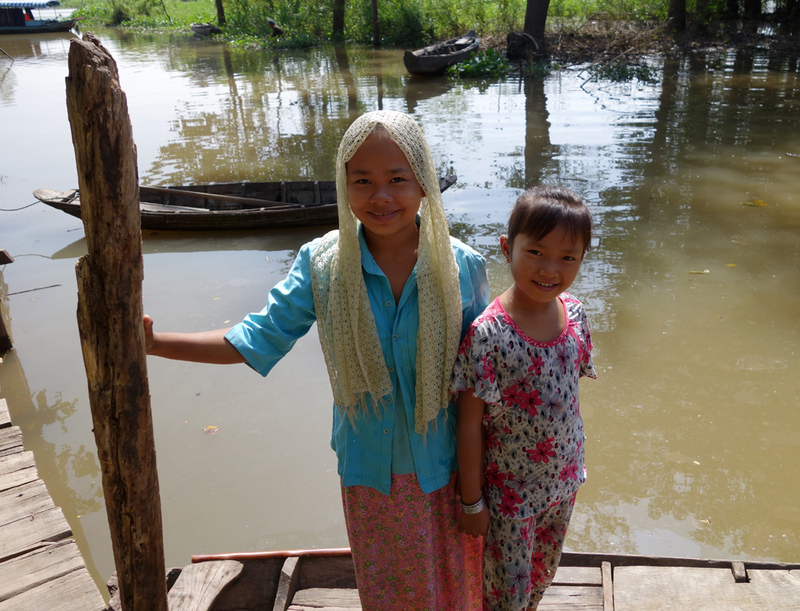 We learned that there are only about 6000 Cham people at this location. 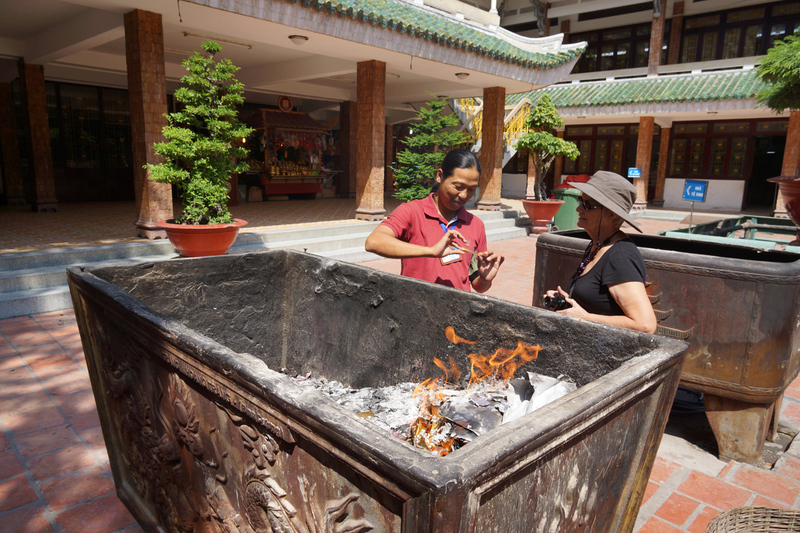 The Vietnamese are very tolerant of all faiths and they seem to respect individual beliefs, whether Muslin, Buddhist, Catholic, Confucianist, and Tao. As you would expect, the country is 85 % Buddhist, but it is practiced differently here than in Cambodia. 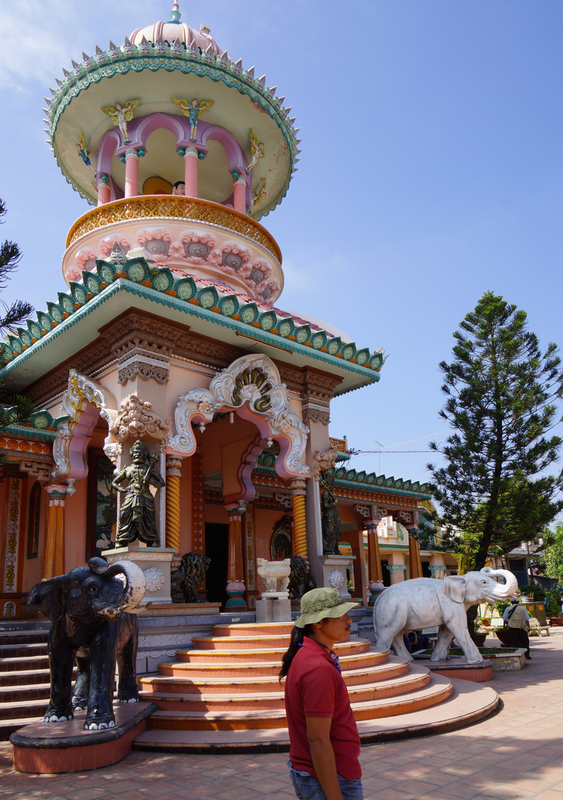 For example one can visit most Buddhist temples in Vietnam without taking off your shoes, and most Vietnamese do not necessarily go to the temple everyday, like the more devout Cambodians. 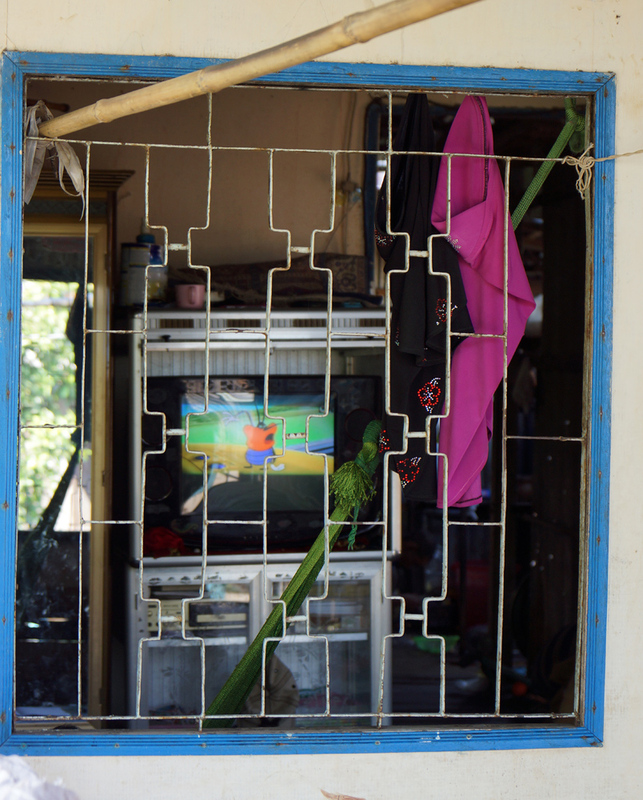 They tell us “Vietnamese are more interested in the heart of people rather than just the outside looks”. Hmmmm . . . not quite sure what that means, but I get the drift: they are more laid-back about their religious practices. 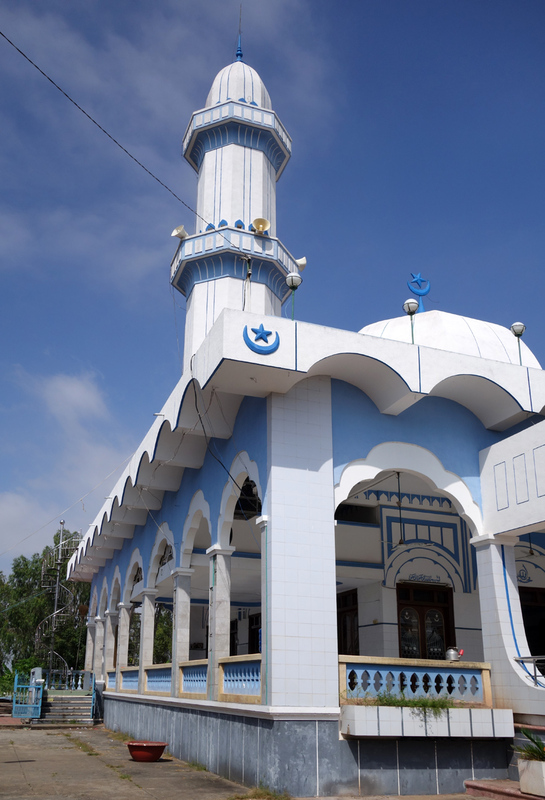 the Muslim Temple servicing the Cham in the village we visited. 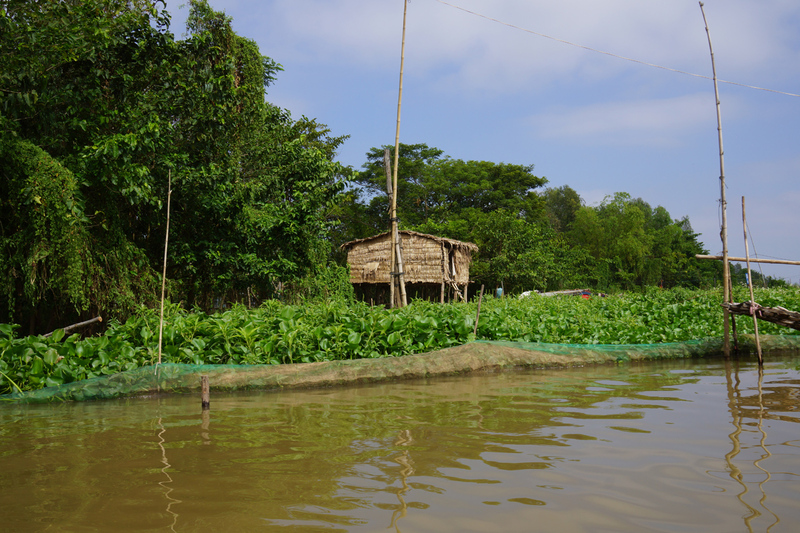 A Water Hyacinth patch surrounding a river dwelling. 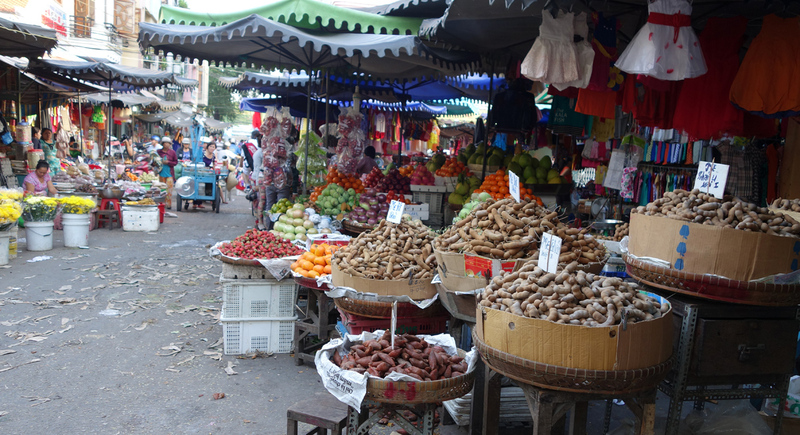 This plant is used by river-dwellers as a sale commodity: both the flower and the plant itself are used, for food, health products and decoration. And its floating EVERYWHERE in the rivers and canals. Hau River. Note the small V-8 engine on the “long-tail” boat. Fast and noisy! 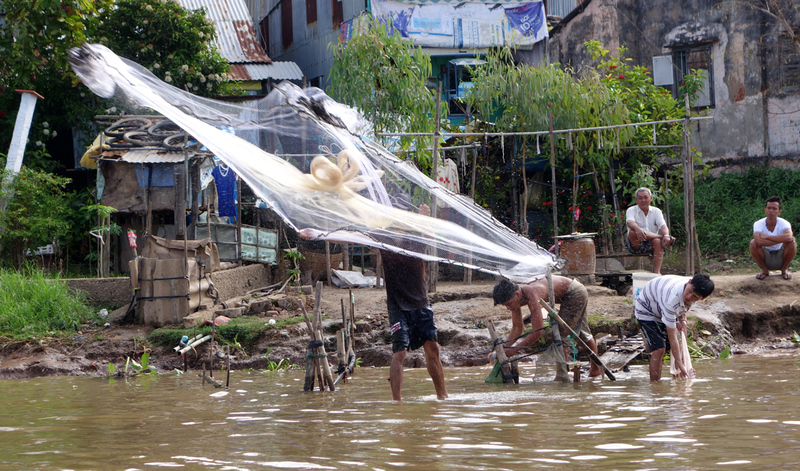 Traditional fishing by a woman in the river, setting a small gill net held up by pieces of styrofoam. The Tay An Pagoda is an old one, built with a mixture of Vietnamese and Asian architectural styles built in the 1800’s. Resting at the base of ‘Sam’ Mountain, the pagoda looks like a monk dressed all in yellow. The look and feel of this one is very Indian: it has an oval dome and the roof underneath looks like a sailing ship. It was built by a provincial chief that had a vision of a 6-colored cloud with a Bodhisttva smiling down on him and the surrounding rice fields. Hence, VERY colorful Pagoda, to ensure good rice harvest! 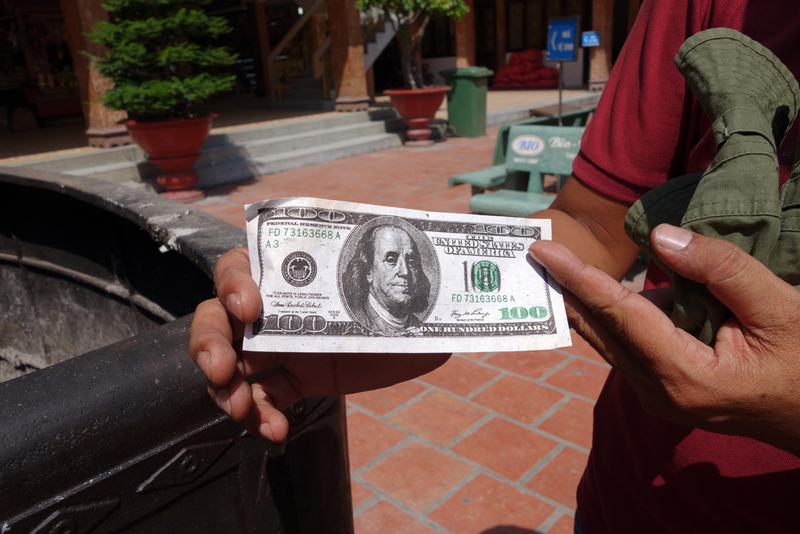 Fake $100 US dollar bill that worshipers at the Chuca Xu Temple burn, along with other “valuable” items, as a token of their devotion to the Goddess. Burning of dollar bills for departed ancestors. 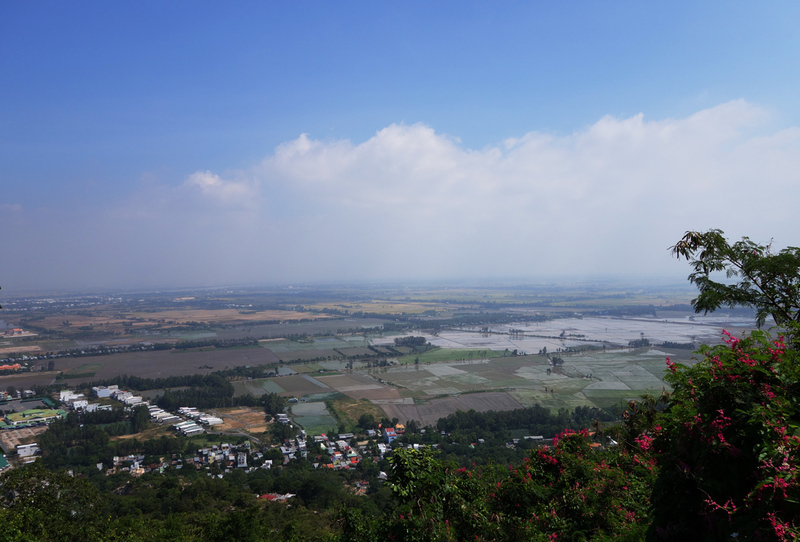 We then drove up Sam Mountain for a 360 views over both the Cambodian and Vietnamese rice fields. 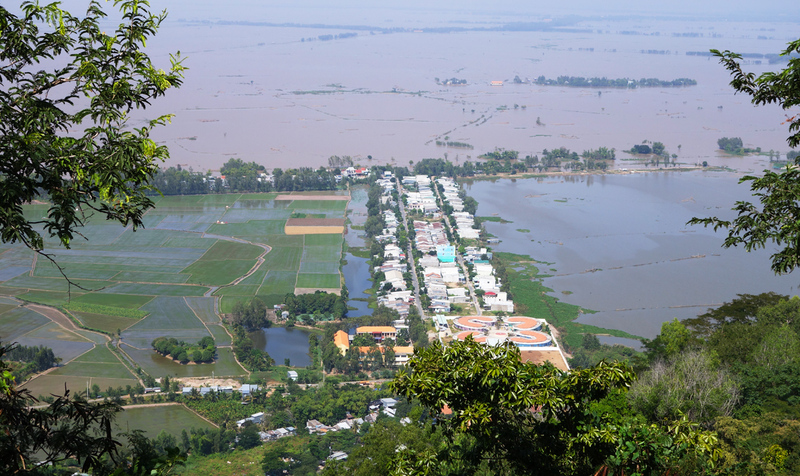 The contrast is striking: Most of the area on the Cambodian side of the border is flooded, or nearly so, while on the Vietnamese side, there are plentiful roads, dikes, canals, modern buildings, etc. A lot of this has to do with the relative prosperity of the Vietnam government, and the lack of same in Cambodia, as well as more people to inhabit and work the land. At the top of Sam Mountain, there is (who would believe it!) another shrine/Pagoda. 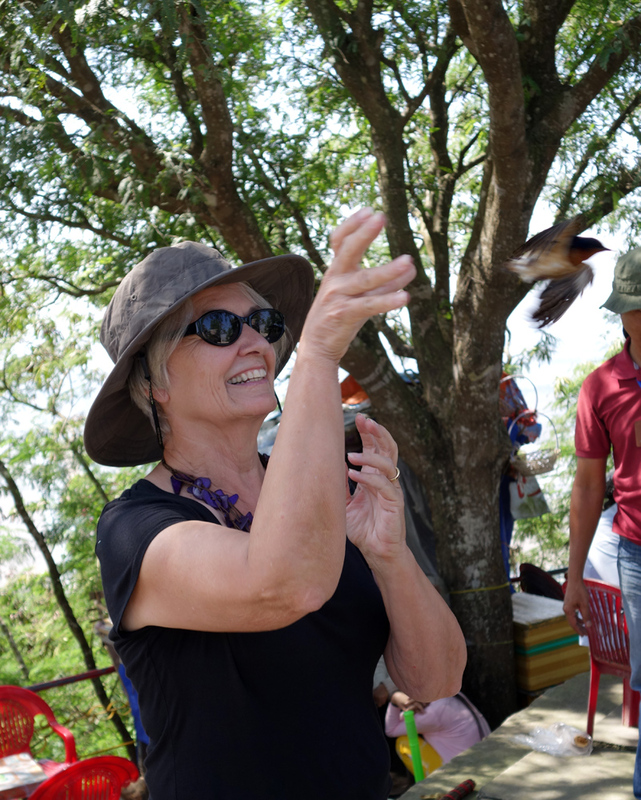 Here there were some friendly ladies, who go out during the day and capture local swallows, place them in a cage, and for only 20,000 VDN (about 95 cents!) you can release several back into the air “for very good fortune”. Evie did so. …and we seem to be having very good fortune on this trip!